My 100 year old home was a neglected mess on the inside and out when we bought it. 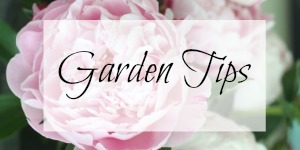 No grass or plants or patio except for a few overgrown scraggly shrubs – an empty slate. 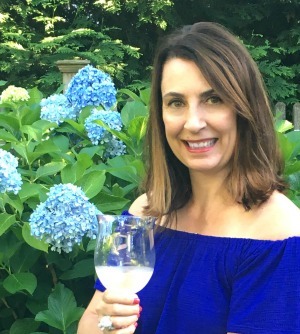 My friend Stephanie of Brooklyn Limestone is featuring my yard today to kick off her “Take it Outside Beautiful Backyard Blogger Series” so I thought it would be fun to take a walk down memory lane and see the process of where my backyard is now and where it’s been. 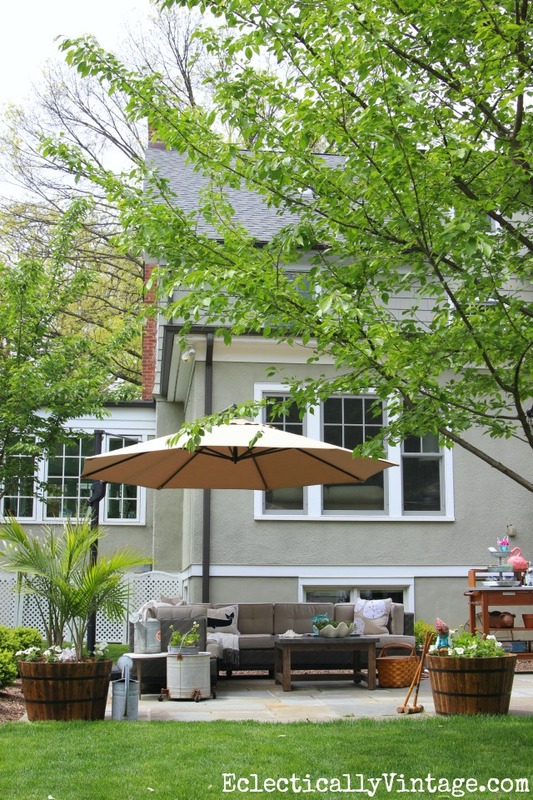 We put in the bluestone patio and planted two trees – they’ve really grown and provide beautiful shade (see more of my current patio HERE). 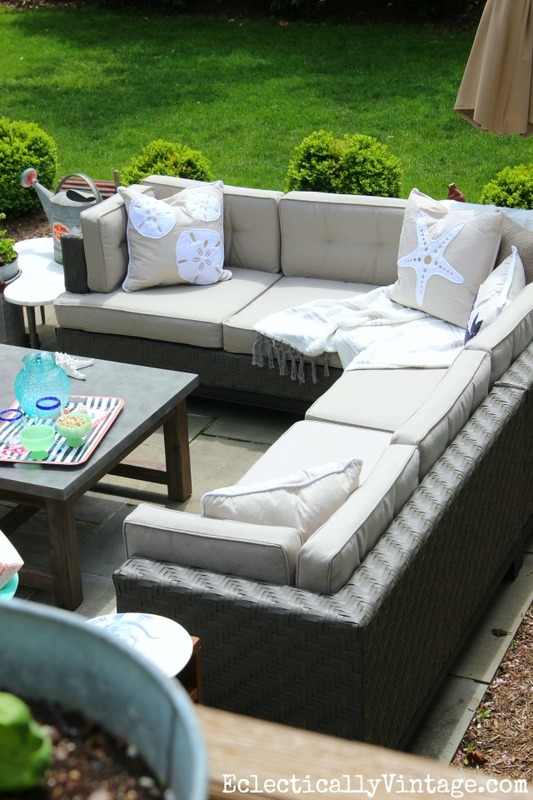 I love having the sectional – it fits so many people and it’s the perfect place to nap. Go big or go home. 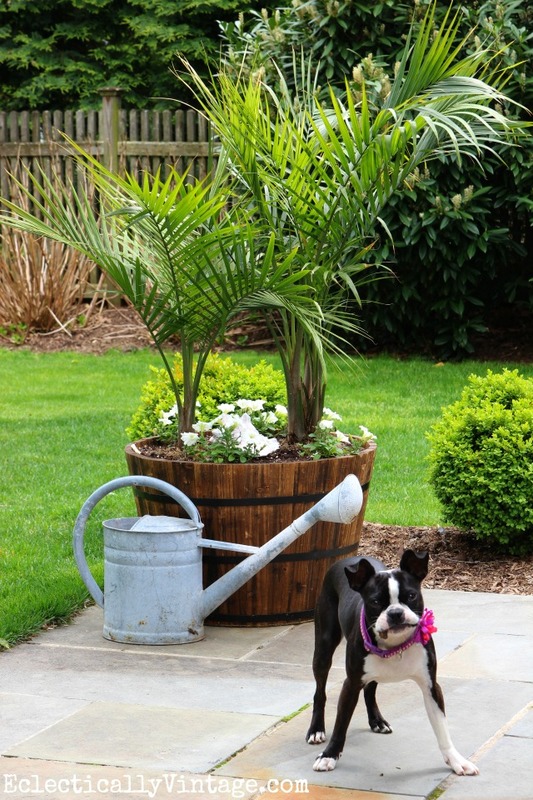 Huge whiskey barrel planters are big enough to fill with palm trees – they really define the patio and make the yard feel like a tropical oasis – margarita anyone? 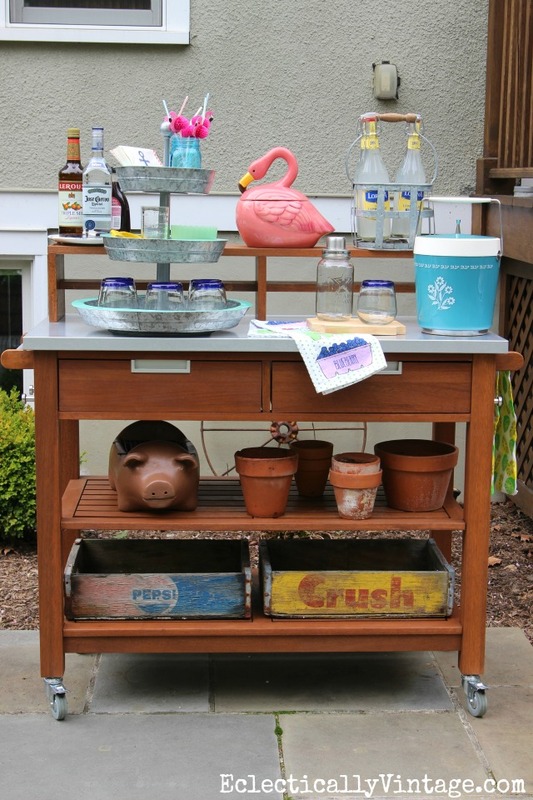 My bar cart is a must for summer entertaining. 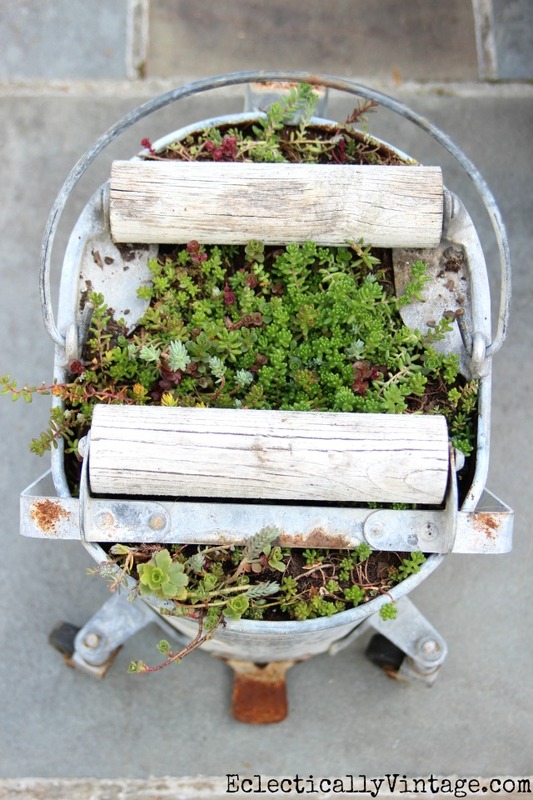 One mainstay of my yard are my old mop bucket planters. This year, I made a giant wood flag and hung it on the side of my garage. See how to make your own HERE. Before the sectional, I had a mis-mash of furniture. I loved it but wanted something larger. I still have the glider – could not part with that! 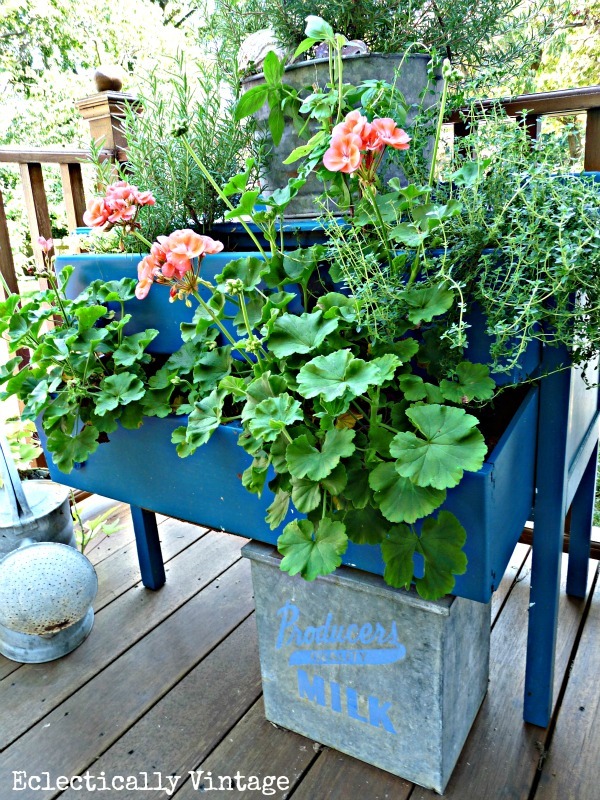 Years ago, I turned this $6 thrift store dresser into the world’s cutest planter – you can see how I did it HERE. I love adding unique objects to my planters like this little ceramic garden orb from HomeGoods tucked into my rosemary plant. Here it is all filled in. It’s since fallen apart – I’ve been on the hunt for a replacement. 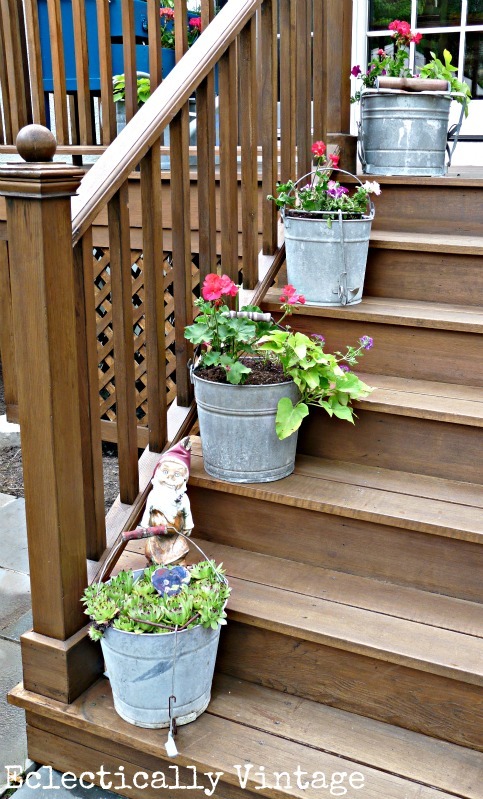 More old mop buckets and galvanized pails line my back steps. 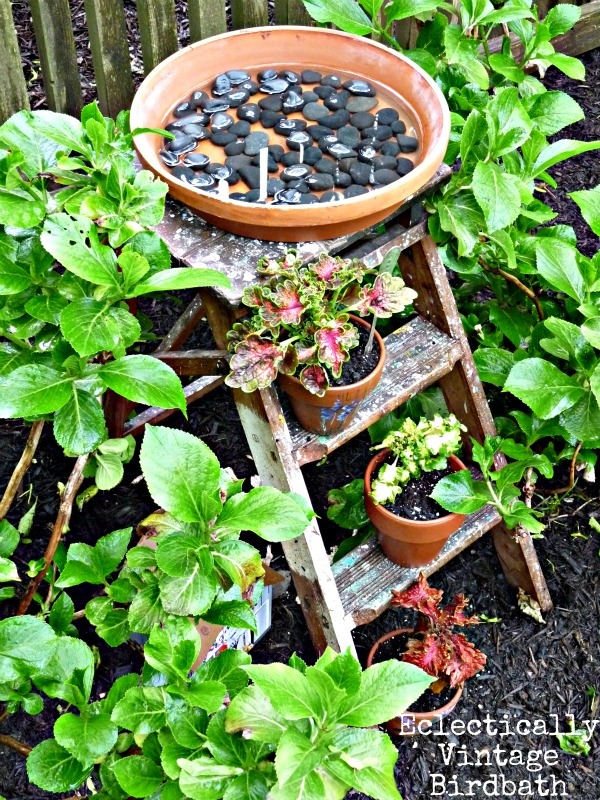 Another staple in my yard is my step ladder bird bath nestled among the hydrangeas. Last year, I planted huge green giant arborvitaes and limelight hydrangeas in the very back of my yard. They are growing like crazy in such a short time! 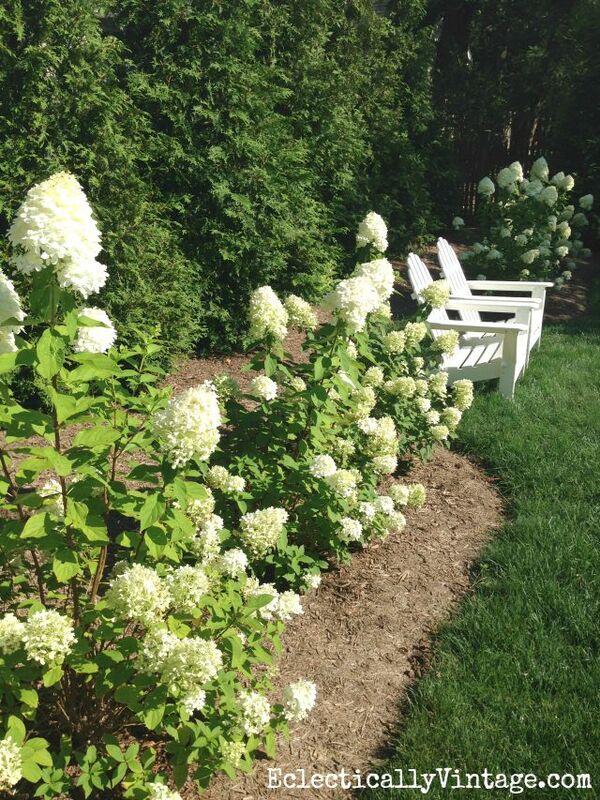 Read my tips on growing limelight hydrangeas HERE. My yard is an ever evolving work in progress. 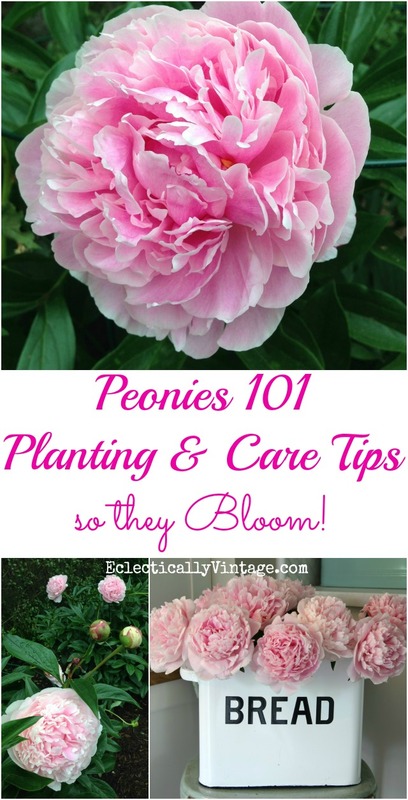 Two things I’ll never change are my abundance of hydrangeas and peonies. « Previous: Sushi – The Pet Therapy Dog! 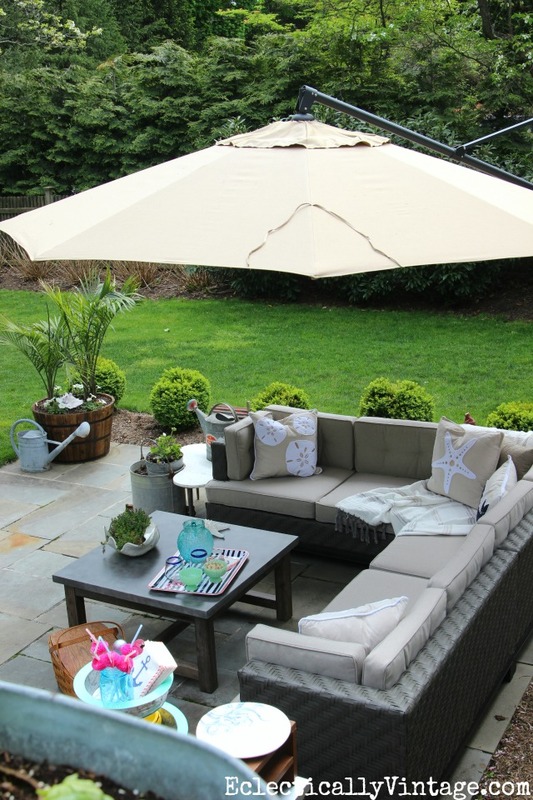 your backyard looks like such a great place to spend time as a family! love the fun quirky touches! Love all your creative planters! What a beautiful, relaxing backyard. Thanks for sharing. So good! Love how you’ve incorporated vintage touches throughout but it still feels manicured and inviting. Thanks for kicking off the series! I just love your yard! How well does the furniture hold up with hot humid summers though? Seems every time I use a piece of furniture in the yard that it quickly becomes too worn/dirty looking to be used. 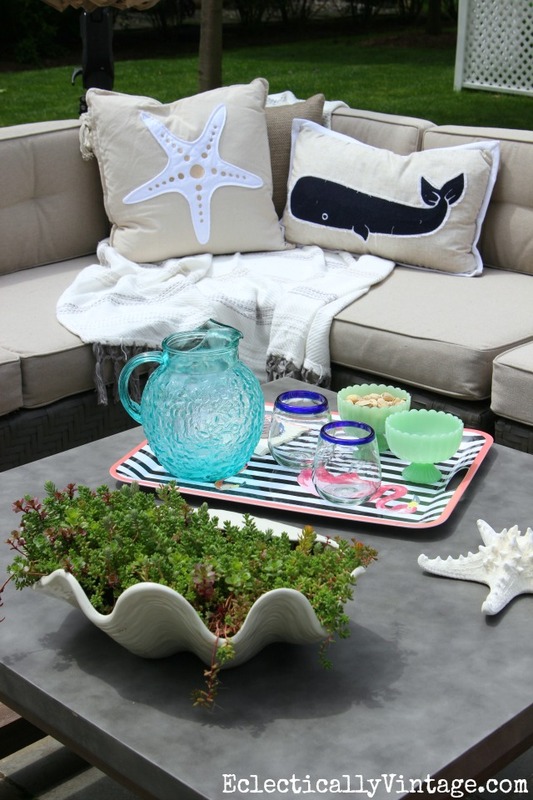 The furniture is new this summer and I bring the cushions in when it rains. It seems very well made and easy to clean. Love your backyard, it must smell wonderful. When it isn’t so hot it is a great place to relax. The petunias do smell amazing Marlene! Very inviting! 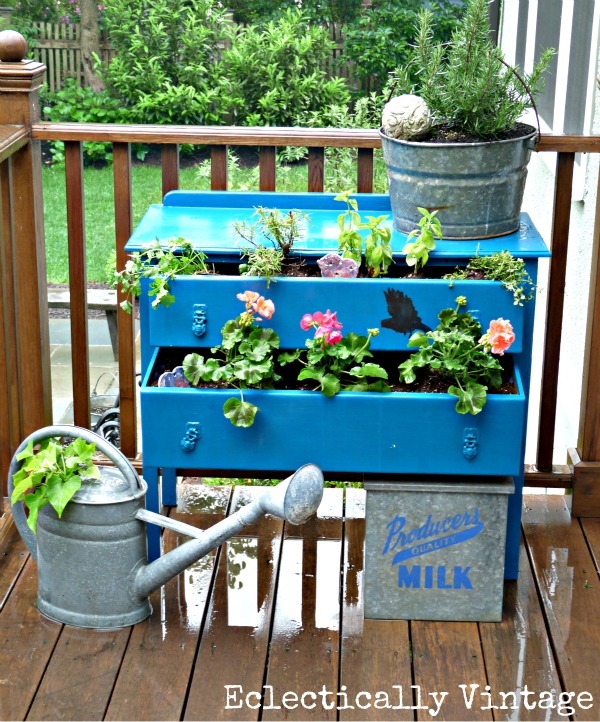 I love the planter/chest idea and I have a mop bucket as well. Weird that I love mop buckets but hat mopping! Two thumbs down on mopping here, too! 🙂 A friend had a mop bucket and I hunted till I found one and have really enjoyed mine and get compliments. Hope you find more Karen! Kelly, I adore your yard, those mop buckets are awesome. 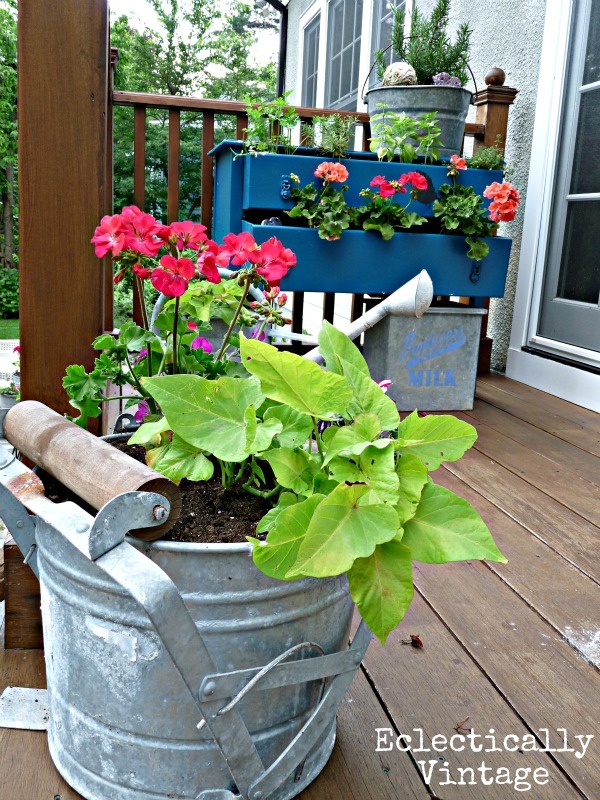 Thanks Cindy – they are my favorite planters! Thanks Laura – yes that dresser was done some time ago! 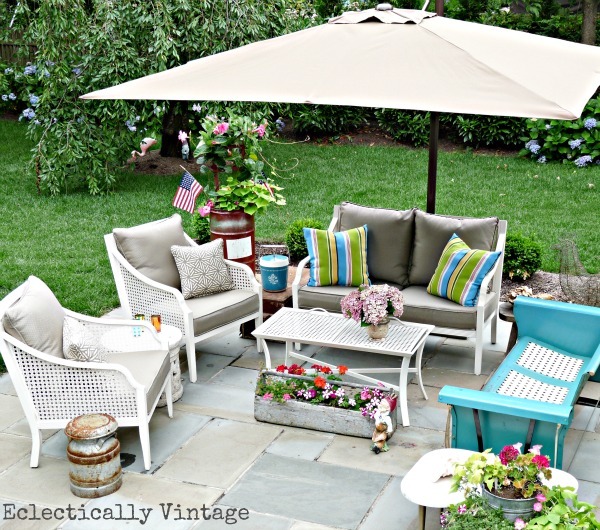 Love your attitude of go big or go home!…Just love your new outdoor furniture….and I have a soft spot for your old set! 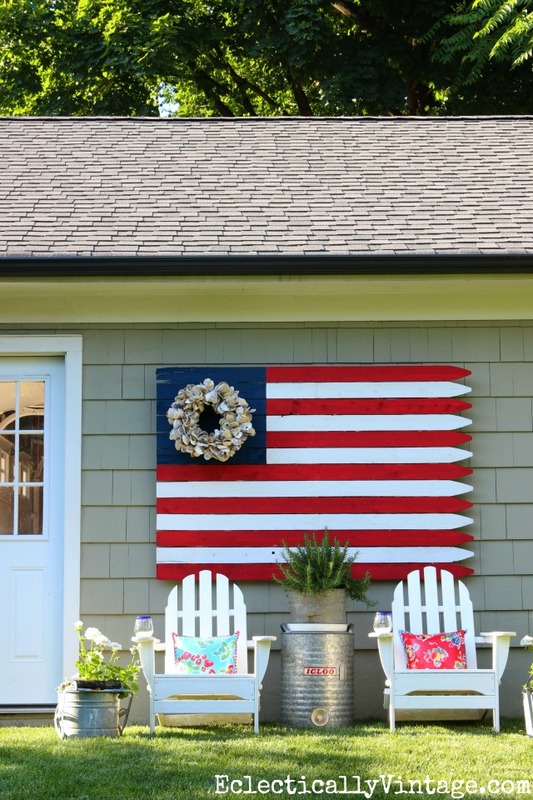 Beautiful patio…gorgeous yard…and love that huge flag art!! 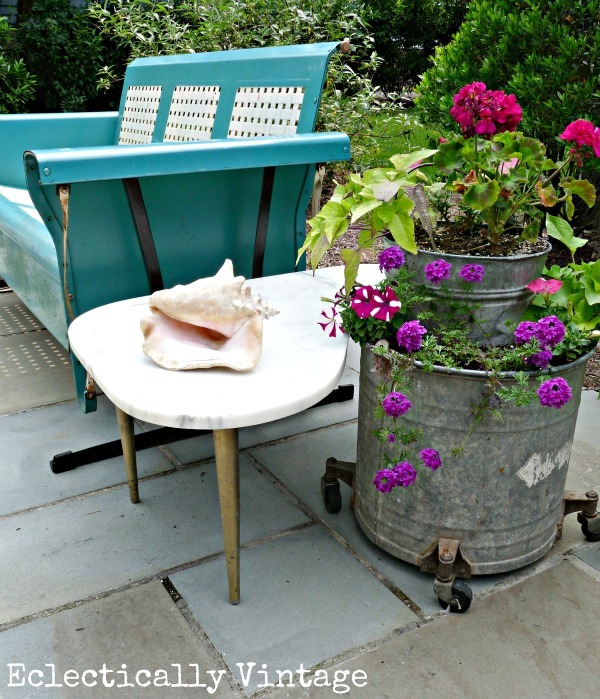 Thanks Shirley – my old furniture looks great on my friends porch! 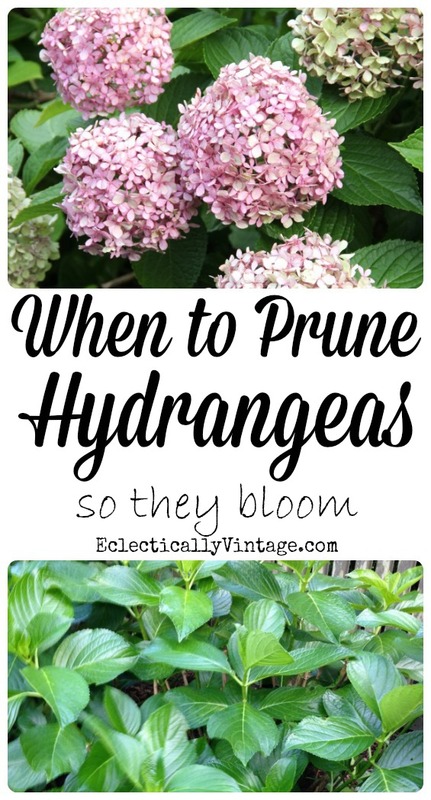 Your yard looks like an oasis! It’s beautiful. Do you happen to know the paint color of your home’s exterior? It’s Creekside Green (Ben Moore) but it’s not the full tint. I can’t remember if I did 25% or 50% Katy!